1. What are the main ingredients of the Puritee Natural Soaps? 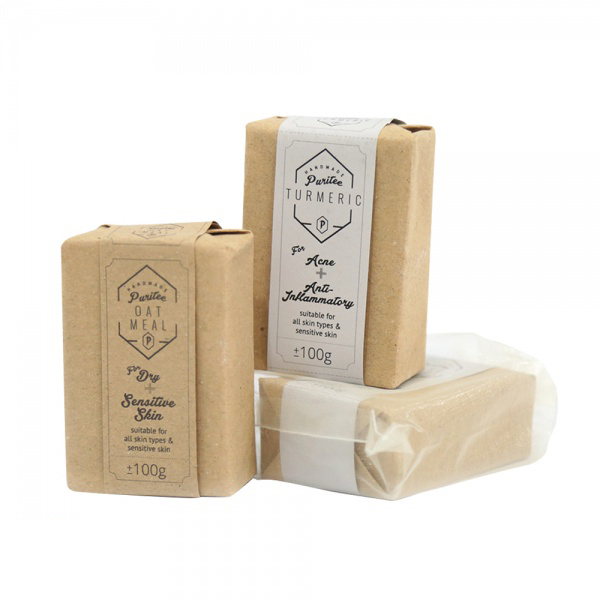 The main ingredients of the Puritee Natural Soaps are Argan Oil, Olive Oil, Coconut Oil & Palm Oil. The rest of the ingredients e.g. herbs, essential oils, clays etc. are added on for specific purposes to enhance the soap for healthy skin. 2. Why is lye required to make soap? Lye or Sodium Hydroxide is required to make natural soap. The chemical reaction between oils and lye, a process called saponification, will form a completely new material called soap. No lye will remain in the finished product. 3. Are Puritee Natural Soaps handmade? Absolutely. This is made by a professional corporate personality turned soap maker. This is her passion and personally hand makes them. So no piece is alike. Healthtrend is blessed to be associated with her. 4. Does Puritee Natural Soaps contain any harmful ingredients? No and this is guaranteed. There are no artificial dyes, perfumes nor foaming agents. Absolutely no questionable nor toxic substances added. There are also no chemical names that you cannot pronounce. Our soaps are also good for the environment. 5. Does Puritee Natural Soaps contain any animal products? No. Definitely not. No animal oils and even the lye is plant based. 6. Since Puritee Natural Soaps is hand made, are they made from the same cooking utensils for food? No. The soap making utensils are separate from the everyday cooking utensils. 7. Can the Puritee Natural Soaps be used on the face? Absolutely. This is made for the face as well as the body. The soap can also be used for the hair as a substitute for shampoo. 8. Why is the soap always out of stock? As the soaps are handmade, homemade and requires a curing period of 4 weeks, and popular, the Puritee Natural Soaps can often be out of stock. Just call us and we will be able to reserve for you once the stock arrives. 9. How can the soap lather without the addition of foaming agents? The fluffy lather is due to the coconut oil and nothing else. The longer you keep the soap, the better it lathers. 10. How long can a bar of soap last? If you bathe several times a day and use the soap during every bath, each bar will last you approximately 1 month. This comes to about 60sen/day for something which is so safe and good for the skin. If you just use it once a day, then a bar can last for several months. This boils down to only a few sens per day. If you use the soap to wash your hands, it can last 3 -4 months. It would however be a waste to just use such good soap on your hands. 11. Why do soaps always become soft and slimy after some time of usage? This is the case only when the soap is in constant contact or immersed in water. Our soap comes in a gauze bag. Once you unwrap the soap from the paper covering, put the soap back into the gauze bag. It can be used together when bathing as a soap and scourer. After bathing, hang the pouch away from the shower using a hook. The clip on suction hook can be purchased from any hardware shop. 12. Why do the Puritee Natural soaps look so drab when compared with other soaps? Why? Because everything is natural with no colouring agents at all. It is the healthy goodness that we want and not how it looks. 13. Can the Puritee Natural soaps be used on babies? Babies below 8 months cannot synthesise essential oils. Hence, wait until they are about 1 year old before exposing them to our soap. Who knows, we may formulate soaps just for newborns. Please wait for our announcement. 14. Are the Puritee Natural soaps halal? They are not certified halal but no animal fats or other ingredients which contain animal derived additives are used. Ingredients: Hand made naturally from Argan oil, olive oil, coconut oil, palm oil, Moroccan Rhassoul Ghassoul lava clay, water, essential oil & NaOH (lye). This is for detox and an excellent facial cleaner especially for those with sensitive skin. The Moroccan clay is a high quality soothing clay sourced from the Atlas Mountains in Morocco. Ingredients: Hand made naturally from Argan oil, olive oil, coconut oil, palm oil, turmeric, water, essential oil & NaOH (lye). This is for glowing skin, anti-inflammatory and is good for acne skin. Reduces redness and moisturizes as well. Ingredients: Handmade naturally from Argan oil, olive oil, coconut oil, palm oil, rose bud powder, water, essential oil & NaOH (lye). Rose bud powder provides the fragrance, has anti-aging as well as skin rejuvenating properties. Ingredients: Handmade naturally from Argan oil, olive oil, coconut oil, palm oil, oat meal & essential oil. Anyone who has had chicken pox, a bug bite or very dry skin knows that the urge to scratch can often be worse than the itch itself. In ground form, oatmeal can help to alleviate the itch and its accompanying swelling as well as the desire to itch.